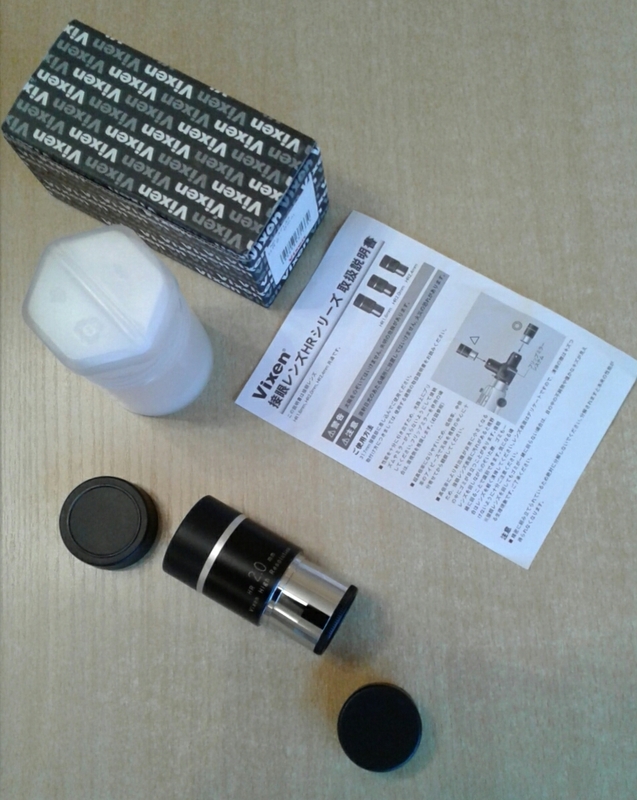 I received a new addition to my growing family of eyepieces this morning. A 2mm Vixen HR eyepiece. As yet I haven't had chance to check out its performance to see if it lives upto its legendary status, but just holding it to my eye it feels amazingly comfortable, giving the impression of having oodles of eye relief. 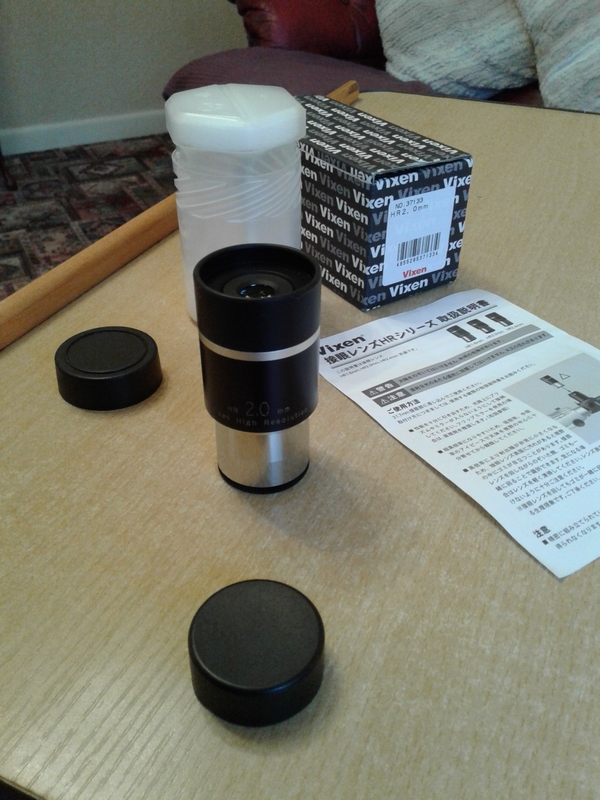 Taky doesn't yet know he has a new eyepiece to play with as he'll get overly excited! Yes, I don't know how they've done it, but somehow they really make this work. Enjoy! Have you any of the other Vixen HR's? Congrats Mike! You will love the 2mm HR. It's a great companion with the FC-100DC. Looking forward hearing your first light. ......Taky doesn't know yet ....... as he'll get overly excited! .... extra focal length then. This is an outstanding eyepiece. With its generous eye lens and 10mm eye relief, it is, as Mike says, remarkably comfortable to use. I’ve never had a chance to use any of the legendary ZAOs or XOs. I’ve sought out eyepieces primarily for sharpness and rendition of detail, tried many, sold many, kept some ... and the result of that distillation process is that, for this sort of observing, I’ve ended up (for now) with most of the Tak orthos, a mono, some TV Plossls and a couple of Edmund RKEs. If I could keep only one range, it would be the Taks. I still think the Taks are very good, but if the HRs were available in longer focal lengths, I think the shorter Taks would be heading off into the sunset. Reportedly, the design of the Vixens can’t just be scaled to longer fls - I don’t know whether that’s true or not - so the Taks are safe. The Moon was the obvious target that night. I had the V HR on a TEC 140 with the Zeiss-Baader 1.25 prism. I wasn’t sure quite what to expect - habitually, I’ve tended not to push high mags very often, preferring aesthetically ‘enough mag’ and a crisper albeit smaller view. The V HR could change all that - it was a revelation. 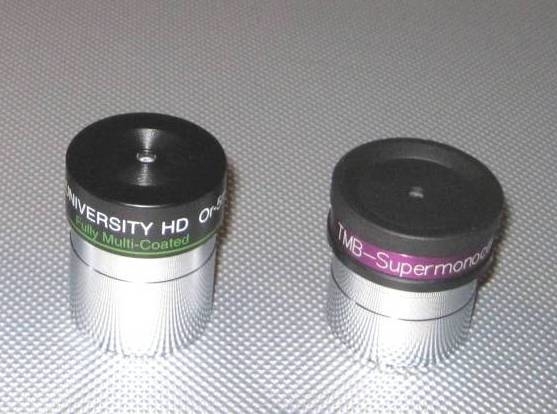 I agree with everything that Bill Paolini says about the these eyepieces in his expert review. The image quality in terms of sharpness, contrast and freedom from scatter are the best I’ve seen. The excellent build, attention to detail and refinement of the eyepiece make it a pleasure to use. In this brief first light, I sought to compare its performance with the closest thing I could find: my Tak 6mm ortho barlowed x2 with a TV Powermate. Scanning the terminator, I ended up focusing more on Aristarchus and the interesting region around it. The Vixen gave x288 and the barlowed Tak x327. You might be expecting me to say that the Tak was ‘blown away’ by the Vixen. That was not the case. The Tak stood up very well giving good sharpness, contrast and consequent detail. The scatter, I think, was a little greater than the Vixen’s which, effectively, had none. The Vixen had the edge in its capacity to render detail, for example in the crater’s stepped walls, but not by much. What it did have was a marvellously graded contrast, more refined, to my eye, and ‘photographic’ than was provided by the Tak, which though not short on sharpness showed a harder contrast that might have concealed detail within its brighter zones. Given the smaller eye lens of the Tak, the Vixen was the more comfortable to use. This was just an initial impression but it was nonetheless a conclusive one. This is not an eyepiece that needs to be revisited to be sure of its quality. Since I had the Powermate in the scope, I decided, against all good sense, to put the Vixen in there and see how things looked at x576 ! Well, it wasn’t at all bad. 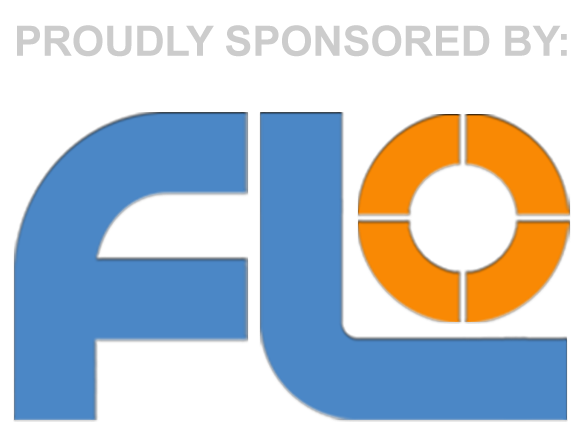 Not surprisingly, I had trouble with floaters with the resultant 0.24 mm exit pupil, so couldn’t imagine doing this very often ... but, and here’s the remarkable thing, the image was entirely useable. Yes it was softer, but the tonal qualities of the eyepiece were retained, giving contour and presence to isolated peaks and ranges and to subtler undulations in the basaltic plain. This eyepiece and the others in the range feel like real game-changers! Not as yet Jeremy. Though I'd definitely be interested in the others in the range if the 2mm is anything to go by! It's good to see and hear about top flight planetary / lunar eyepieces that are actually obtainable. It's all well and good to read these mouthwatering accounts of Zeiss ZAO's, AP SPL's, TMB Supermonos and Pentax XO's but such gems are now practically "unobtanium" at any price. The Vixen HR's can readily be bought from a number of sources and seem to be in the same league. It's good to see and hear about top flight planetary﻿﻿ / ﻿lunar eyepieces that are actually obtainable. The offer still stands for you to review the full set. I'd love to try the TOE's John. It's just a shame we can't generally test drive them before buying. I think it would be nice to have the entire range of both the HR's and the TOE's then I could fine tune the magnification in style. Typically, its cloudy here tonight, but earlier this afternoon I took a sneaky peek at some street lights and tree branches. Despite looking through double glazing with the heating on, the lights were sharply defined, the branches were straight across the entire field with no indication of field curvature, and the field stop was sharp. Can't wait for a starry night! This morning after dropping my son off at work, I had my first real opportunity to try out my new 2mm HR on Venus. The Sun was rising but I could still see Venus easily enough against the clear blue sky, so I set the FC100 up on my AZ4. Arguably not the most obvious choice of mount for high powered planetary observation, but Venus was below my observatory wall, and with the AZ4 being my grab and go mount, I thought I'd kill two birds with one stone by trying them together. 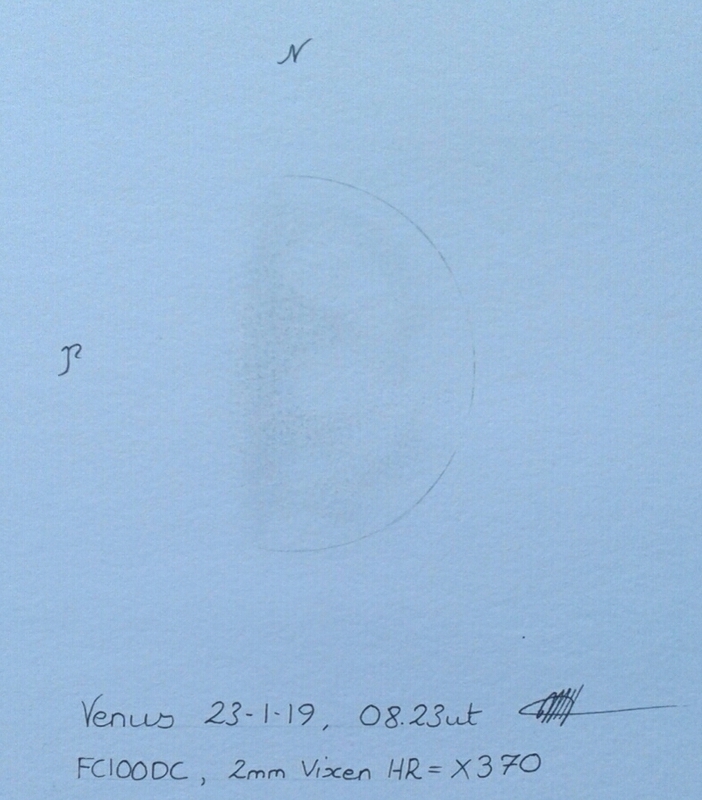 The eyepiece gave a very sharp, crisp view of Venus at X370, and despite the high power, the eye relief was excellent and the field of view did not feel restrictive in any way. The AZ4 mounted on my old heavy duty Vixen tripod also handled this high power very well. The telescope remained stable, and keeping the planet in the centre of the field was an easy task with just the touch of a finger. Sadly the moon had dropped below the tree line by the time I'd got back home this morning, so I couldn't try the eyepiece on it. But the crispness and clarity of Venus has given me at least some idea of the joys that await me on the Moon. Taky was very excited when I put the new eyepiece in, as he wouldn't let the image settle for a good five minutes, but then he calmed down and delivered a great view. Well, its been either pretty awful seeing or far too cold for comfort, so getting an opportunity to really try out the 2mm HR has been held at bay, until tonight. The Moon was high in a clear darkening blue sky as the Sun dropped below my western horizon. I'd set the Tak FC100DC up on the Vixen GP in the observatory and rolled back the roof. I spent a little time enjoying low power views while the scope cooled. There's something magical about seeing the moon hanging in almost 3D in a low power field. Initially I used my 35mm Eudiascopic, giving X21 which is a very comfortable and well corrected eyepiece. Then moving to a 18mm Celestron Ultima, which is another great eyepiece giving a power of X41, the Moon almost filled the field of view, with the eyepiece offering some razor sharp views of the entire terminator. 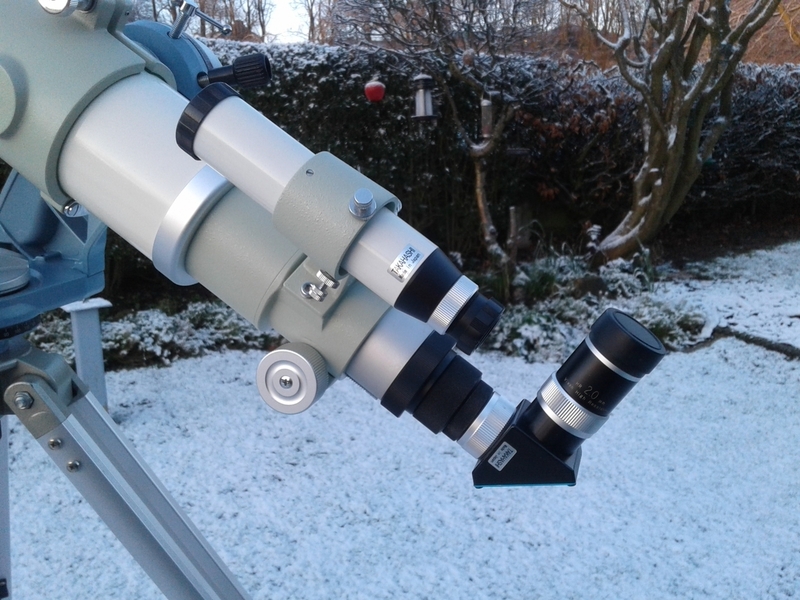 Then as the scope cooled down, I added a 2X Ultima barlow to the 18mm Ultima which gave a truly breathtaking view. 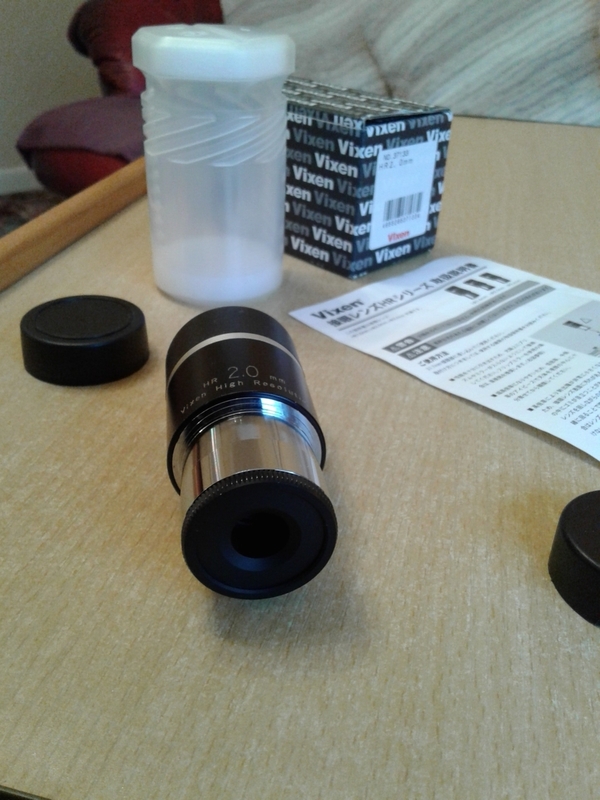 Now with the scope thermally stable, I removed the Ultima and fit my new Vixen 2mm HR eyepiece. The eyepiece is unbelievably comfortable, and the view of the moon presented itself as being wonderfully sharp and detailed at X370 in the 100mm apo. I spent the best part of an hour travelling back and forth along the terminator, occasionally needing to lightly touch the microfocuser to keep the image razor sharp. Intricate rille systems revealed themselves with great ease while the countless mountain size boulders, debris from the massive impacts that created the mare, glistened as the suns light touched their rugged peaks, looking like millions of needle points. Crater terracing remained highly detailed as did their complex floors. Such detail can often suffer as magnification increases, but in the HR there was no indication of softening of the lunar detail. Initially when I bought this eyepiece, I did so with the intention of using it solely for observing Mars while it is around 5 arc seconds. After tonight's session with the 2mm HR however, i can honestly say ill be using this little gem far more often than i initially imagined doing. The comfort and edge to edge sharpness of the HR has impressed me so much that i really would like to buy more of them, though I'm not sure I'd need them all! Then again.....!! Mike, I enjoyed reading your report! Tonight I observed the Moon as well with the Vixen HR 2mm and the FS-102NSV. The views were breathtaking, too much details to describe. I tried the Pentax XO 2.5mm as well, but that eyepiece is no where as comfortable as the Vixen HR. The XO shines on the planets, not so much on the Moon. I was doing something similar with my Tak FC100-DL and the Nagler zoom 2-4mm. Similar results under very stable seeing despite some thin cloud. Good to see that Vixen have produced something that rivals the so called "top tier" high power eyepieces but is actually available and, relatively speaking, affordable. The TMB Supermonos, Zeiss ZAO's and Pentax XO's were fetching eye watering prices if you ever saw them for sale. Nice report. As per another thread I am looking for a really nice high powered EP and Vixen were on the list. I think you may have just pushed me into a decision. 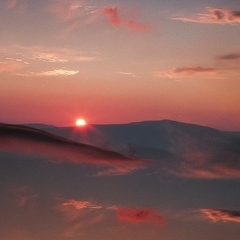 There was thin cloud here too John, which gave a milky glow to the background sky. Then on occasion I was clouded out for short periods. Normally I'm much happier using my binoviewer, but last night and largely due to the comfort of the HR, I lost track of time as I got lost in the terminator. There was a slight issue with floaters while using the 2mm, but rotating the diagonal allowed me to find an eye position where they were not so much of a problem. A consequence of getting older I'm afraid! I can see me acquiring the 2.4mm and the 3.4mm in the not too distant future as I think they will be value able for use with the FC. Then I've also been toying with the idea of a Tak turret which should make flitting between powers much easier, especially with Mars. If only I had Gavin's cheque book, or a wife who wasn't so Hawkeyed! Still, I keep telling myself Its fun to save, as I'll appreciate it more when I get it - whatever It is! 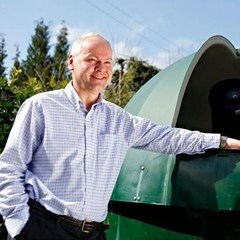 Sounds like you have obtained a gem of an eyepiece Mike. 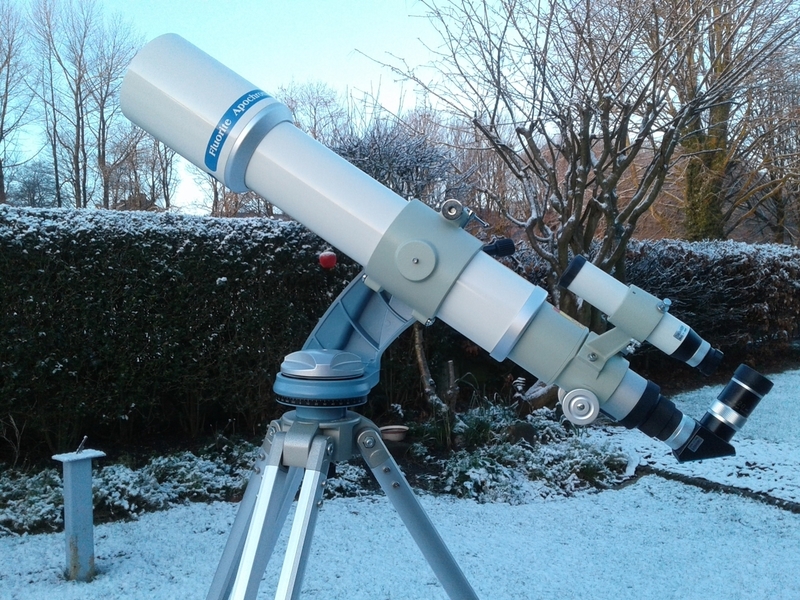 I am wondering about these one day too as my 3-6 Nagler zoom on Lunar shows my Vixen ED103s can take some more Lunar magnification in good conditions. Nice one Mike I very much enjoy my 3.4mm HR, I can't believe I was so skeptical of them when they first launched.